Boisdale Prize on to a Winner! Boisdale Prize competition leads to winning design for the Tapestry. Tapestry designer Andrew Crummy has been extremely busy drawing panels for stitchers around the globe, but he has now received a little help from Lachie Robinson in the highlands of Scotland. Her winning entry into the annual Boisdale Prize schools art competition is to be incorporated into the Scottish Diaspora Tapestry! Andrew said: "There were so many lovely designs. The winning design by Lachie Robinson is well researched, imaginative and well drawn... I think it is important that a young person from Mallaig School has so wonderfully expressed the sense of leaving for the new world." 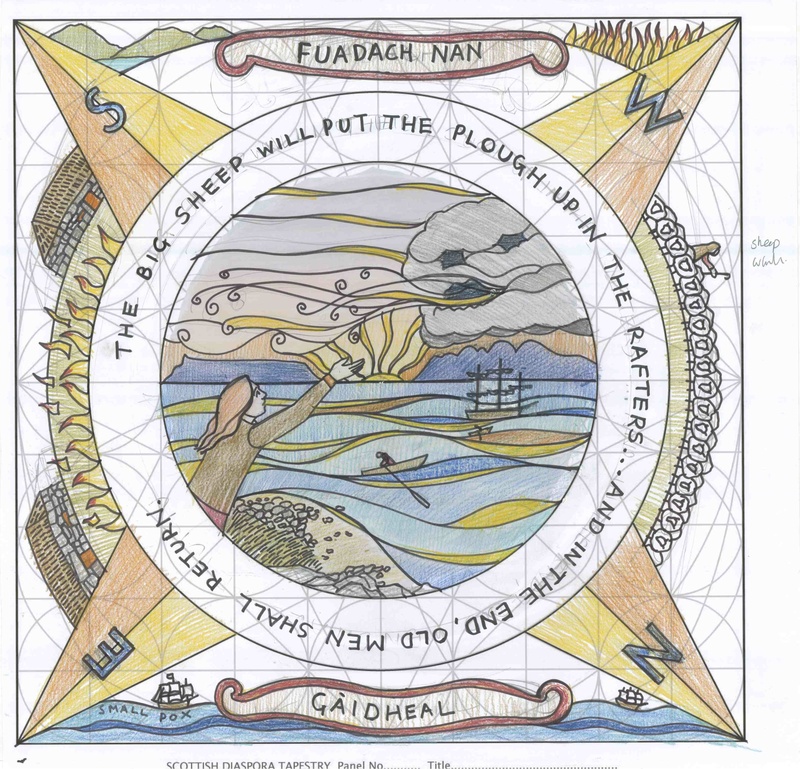 The Boisdale Prize, part of the build up to the much-anticipated Arisaig Highland Games 2014, saw school children in the region creating illustrations relating to the Diaspora theme, “The Warp and the Weft: What it Means to Get On With It”. They used the Tapestry's design template (see it here) to structure their exploration of what leaving Scotland might have meant to those who emigrated from their region. Andrew then travelled north to deliberate over the entries. It was no easy task to choose the winners, as the designs shown in this video show! Lachie Robinson's design was redrawn full size by Andrew back at the studio, and will now be sent to be stitched locally by a group led by Helen Brodie, a veteran of the Battle of Prestonpans Tapestry.